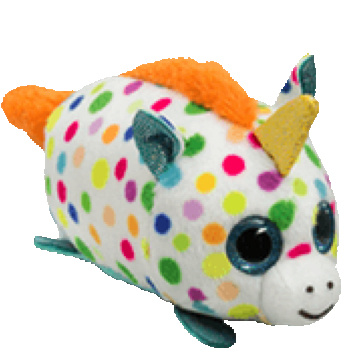 Star is a tiny white unicorn covered in a multi-coloured polka dot pattern. She has blue glittery button eyes and a white muzzle with a black embroidered mouth and nostrils. Her tiny feet are sparkly silver and she has a fluffy orange mane and tail and a shiny gold horn on her head. The three variations of Star are this orange mane version, a purple mane version, and an white mane version.